With 15 years of experience under his belt, the culinary journey of Syrian-born Chef Khder Mohsen Al-Issa began with his restaurateur father. His favorite recipes? Cheese Baklava! Now the Chef de Cuisine at Fuzion restaurant, Sunway Resort Hotel and Spa, Khder has a passion for his Middle Eastern roots, specialising in Syrian, Lebanese and Moroccan cuisine. 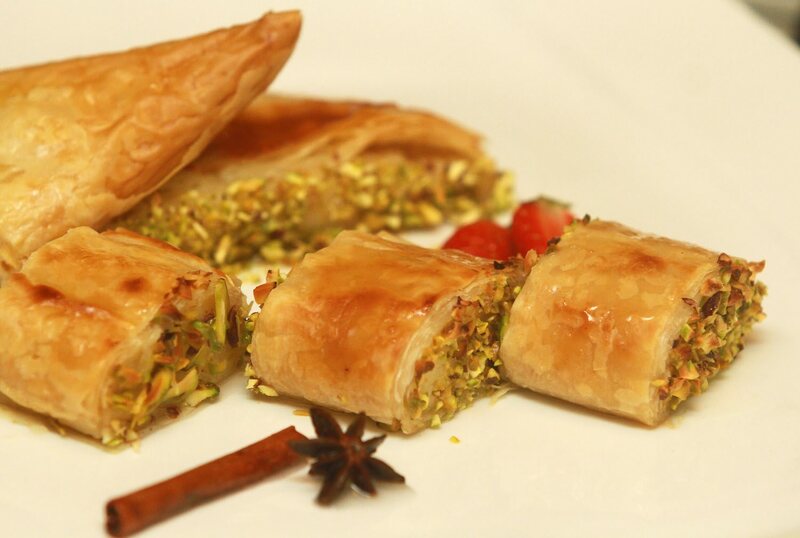 This Ramadan, Khder shares his recipe for a version of a widely popular Middle Eastern snack, the Cheese Baklava. Khder recommends this dish to be served hot and fresh as the cheese melts in your mouth. To prepare the sugar syrup: Mix water and sugar in a pot and bring it to a boil. Add lemon juice, star anise and rose water. Stir for 5 minutes and set it aside to cool down. Baking the baklava: Take one sheet of Phyllo pastry and brush it with olive oil. Place another layer on top of the first sheet and then spread the cheese on top of the second sheet. Repeat this step for the next 2 sheets. Fold the sides of the sheet over the filling and roll it to the end. Brush olive oil all over the top and cut the log into wide pieces of approximately 3cm in length. Place on the baking tray. Preheat oven at 200 degrees Celsius (400 Fahrenheit). Bake for 25 minutes until the top is golden in colour. Immediately pour the syrup all over evenly and let it cool. Sprinkle the ground pistachios all over the top and serve. Is there something wrong with the receipe? Only 1 tbsp of pistachio for the whole receipe.